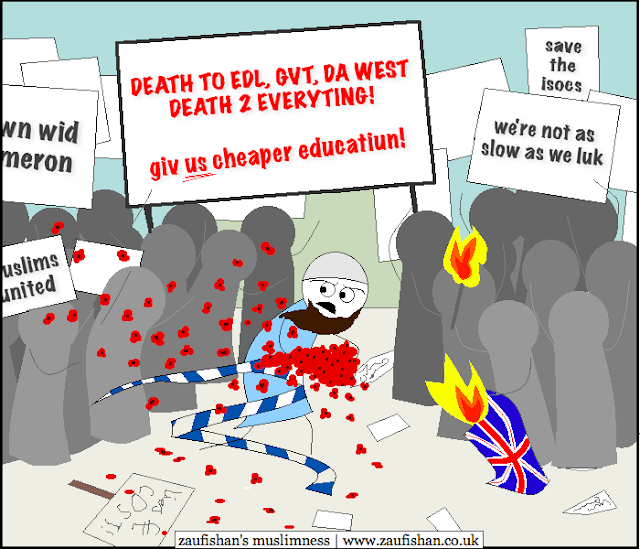 British Muslims are fairly educated, cultured and light-hearted people with above-average social skills. On Remembrance Day 11th November however, some Muslims behaved disgracefully, and, lets face it, like a*ses. I love my Muslim people, but sometimes even the smartest of us reverts to apeness. Latest BBC reports explain how it began: the government piked students' tuition fees (from £3000 to around £9000 annually), this ticked off thousands of university students, I included, and in British fashion, they took to the London streets with lighters and banners. On Remembrance Day. For war veterans, and the dead... with the English Defense League battling on the same day... Can you say 'duh'? I know British Muslims aren't known for their ironies, but they must've really smoked a trippy sheesha that day. Even an Imam in Portsmouth was affected by this stupid behaviour. This is what I keep telling Muslims with rage: What you do in that state, reflects on all of us, so sit down before I slap some sense into you. Fight the battle with the enemy's tools, don't pick up matchsticks. I say we kidnap PM David Cameron and make him cough up the needed cash for our economic state. It's Thatcherism, all, over, again. Y'see, in the long run, the education cutbacks affect Muslims the most because we are already an ethnic minority. Our education gives us the equality and footing we would otherwise struggle for. Education is key. A Muslim's wealth is valuable too, as is his/her image. But will we use our wits to educate our leaders or "downcycle" our ethics for a spot on TV? The value we put on money, subhanAllah. [Imam Abu Eesa Niamatullah asked me to make this comic - it isn't all 'doolally' Imam, we'll get there in the end, inshaAllah. Apologies for swearing. Salamings]. Wow, intense comic and post. Oooo, you ARE cool, ma'sha'allah, Br. Abu Eesa is an awesome speaker (the one about Boys and Girls was great). Yeah, decrease the swearing please, next time - doesn't suit you ;-) But I understand the frustration - really doesn't reflect well on us as a whole. Anywhooo - informative and needed-to-be said post.